A Celebration of Life for Titus Germanicus, Prince of Æthelmearc will be held on August 5, 2018, 9-11 pm in Æthelmearc Kingdom encampment. The Known World mourns the loss of Titus Scipio Germanicus. We, in Æthelmearc knew him as Our King and current Prince but we are not the only ones who grieve. 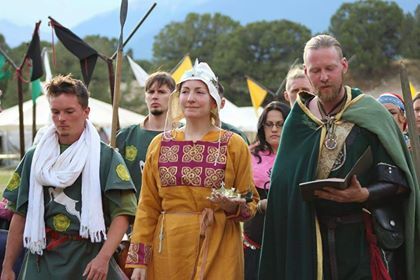 Be welcome and join with those who carry a heavy heart and share what you would with Her Highness Anna Leigh, Sylvan Princess of Æthelmearc. All are welcome. If you have questions or any other things you wish to contribute please contact Magistra Margerite Eisenwald, projectmeek@gmail.com.